It is already known that actor Nithiin is a big fan of Powerstar Pawan Kalyan. He has been showing his love towards his favorite star since the time he has entered into films. Now, he came forward to help Pawan’s party Janasena ahead of the upcoming general elections. Nithiin, along with his father Sudhakar Reddy met Pawan the other day in Bheemavaram and handed over a cheque of Rs. 25 lakhs as a donation for Janasena Party. 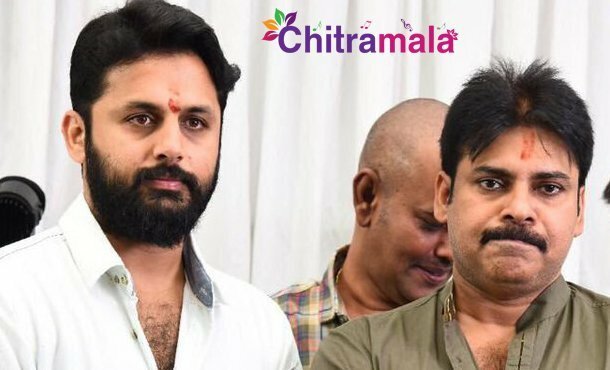 Pawan welcomed the gesture of Nithiin and also thanked them for extending their support to his family. They also spent some time with Pawan and asked about his health condition. It is known that the actor turned politician got dehydrated due to relentless campaigning. Pawan is contesting for an MLA seat from both Bheemavaram and Gajuwaka constituencies.